1980s/’90s wrestling superstar Jake “The Snake” Robers presents his Unspoken Word Tour, where here tells tales of his time in the national spotlight in the ring. Menacing, intimidating and totally hypnotic in the ring, Jake “The Snake” Roberts was a Superstar capable of taking you down physically as well as psychologically. Slithering to the ring with a monstrous python concealed in a burlap sack, Jake used fear as a weapon as deftly as he used pain. His DDT finishing move is still one of the most brutal finishers ever unleashed on a Superstar. The son of noted grappler Grizzly Smith, Roberts was born into a sports-entertainment family. Eager to follow in his father’s footsteps, Roberts began competing in the early ’70s, making a name for himself in promotions throughout the South. In 1983, he tasted success for the first time, winning the NWA World Television Championship while wrestling with Georgia Championship Wrestling. Roberts then took his talent, and his patented DDT finisher to the pinnacle of entertainment, WWE, arriving at the promotion in 1986. Right out of the gate, the Snake sought to make a name for himself, targeting fan favorite Ricky “The Dragon” Steamboat. He made his intentions known when he savagely DDT’d Steamboat onto a concrete floor, putting him in the hospital for weeks. As if that wasn’t enough to curry hatred from the WWE Universe, Roberts stirred the pot further each week, hosting his show, The Snake Pit. A talk segment in the vein of Piper’s Pit, Roberts’s show was the perfect forum for him to rile both Superstars and fans alike with his twisted point of view. As time wore on, Roberts soon became a fan favorite, thanks in part to his memorable rivalries with the Honky Tonk Man, the Million Dollar Man and Andre the Giant. 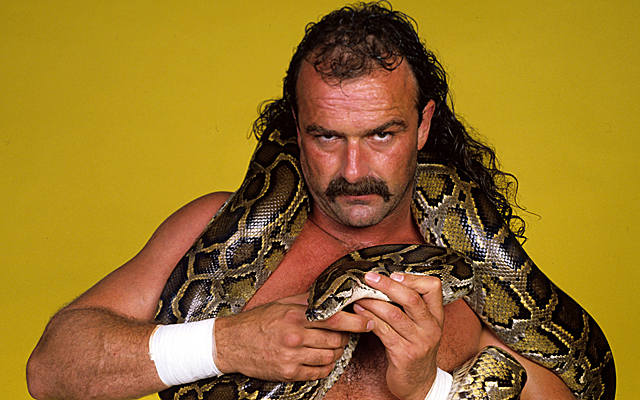 WWE Universe fans from that generation will never forget the Giant’s paralyzing fear of Jake’s pet python, Damien. In the early 90s, after a series of bizarre skirmishes with the likes of Earthquake and Randy Savage, and Rick “The Model” Martel, with whom he faced off against in a Blindfold Match at WrestleMania VII. In 1992, after six extraordinary years, Roberts and WWE parted company and the Snake spent four years competing in WCW and other smaller promotions. Four years later, he returned to WWE and faced Stone Cold at the 1996 King of the Ring. Roberts came up short in the bout, but had a role in the creation of WWE history, when Stone Cold mocked Roberts’s perpetual quoting of the Bible verse “John 3:16,” by barking “Austin 3:16 says ‘I just whooped you’re a$$!’” In that moment, a catchphrase was born and a legend was launched. Following that historic event, Jake’s appearances in WWE have been sporadic but memorable, such as a 2005 appearance on Raw when he confronted a young Randy Orton prior to the Viper’s WrestleMania match against the Undertaker. Later that year he worked with the company to produce the tell-all DVD Pick Your Poison, which offered a no-holds-barred look at his tumultuous career. Whether competing in the ring, or burrowing into the psyches of his opponents, Jake “The Snake” Roberts will go down in the annals of WWE history as one of the most cunning and lethal Superstars ever to step between the ropes. At the River City Pub starting at 7:30 p.m. $20 at the door.